A traditional service includes visitation hours, funeral and burial. This would include visitation and a funeral service, followed by cremation. This would involve removing the deceased from the place of death and transporting them to the crematory. There would be no services. This is a gathering of relatives and friends to remember an individual that has died. It can be held in the funeral home, church or other house of worship, or other location. The deceased is not present. 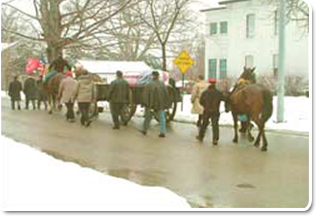 An 1860 Horse Drawn Military Funeral Caisson in Erie County.